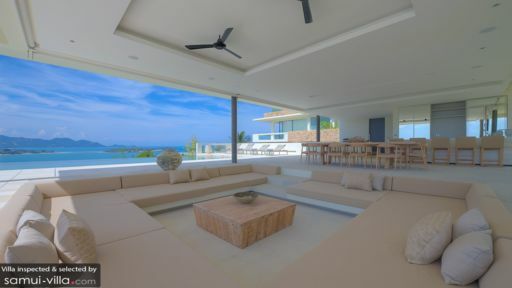 Located atop one of the highest points within the Samujana estate, Villa Yee Sip Jet enjoys incredible vistas over the Gulf of Thailand and picture-perfect sunrise views. Travellers will appreciate the home’s modern, clean-lined decor, indoor-outdoor living spaces and sparkling infinity pool. The villa’s picturesque surroundings, coupled with its capacious living spaces and vast grounds makes it an ideal venue for hosting events and weddings. Eight guests are comfortably accommodated across four bedrooms. Each of the rooms are beautifully appointed, featuring soothing cream colours, quality linen and colourful artworks. Full-length glass walls and sliding doors bring the outdoors in, and create brightly lit interiors. The en suite bathrooms are generously proportioned, and come complete with rain showers and oversized bathtubs. 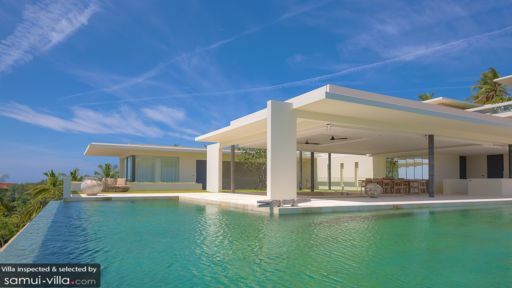 An L-shaped infinity pool takes centerstage outdoors. Its sparkling waters are particularly inviting in the tropical heat of Samui, and once you’re in the pool, you’ll enjoy sweeping views out to the coastline. When you’re done with your swim, dry off against one of the recliners laid out on the pool deck. A, minimalist style is favoured here at Villa Yee Sip Jet. Hues of white, cream and grey make up the colour scheme, and the clean-lined interiors feel wide, open and clutter-free. The main living area, featuring a sunken lounge, dining area and kitchen is set in an indoor-outdoor pavilion. There’s a second kitchen located elsewhere in the compound, along with a private gym, office space and AV media room. Airport transfers, daily breakfast service, housekeeping service, personal guest service, security service and welcome drinks are included with your stay. Bicycles, boat rental, vehicle rental (car and scooter), private driver service, personal chef service, laundry service and in-villa massages are available at additional cost. A baby cot is available free of charge, while child minding service may be arranged at additional charges. 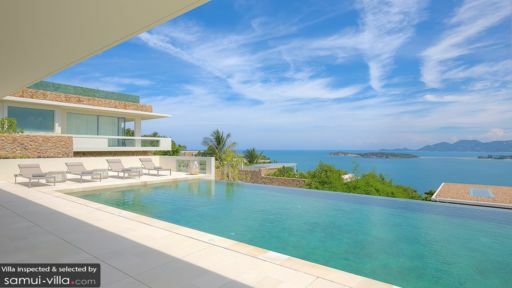 Villa Yee Sip Jet is located in Choeng Mon, a coastal village in the northeastern region of Samui. Featuring wide, sandy beaches, with plenty of activities and restaurants to choose from, it’s an area popular with family vacationers and couples alike. Spend your days sunbathing, swimming, snorkeling or diving at Choeng Mon Beach. From your villa, you’re just a 12-minute ride Wat Phra Yai. The temple complex, featuring a golden 12-metre seated Buddha statue is Samui’s landmark attraction. On Friday evenings, head over to Fisherman’s Village to explore its bustling walking street. It offers a fun family experience, and is a great way to discover the local street food and shopping scene. The Yogarden Samui is one of our favourite places to unwind. There’s a wide-ranging variety of yoga, meditation and fitness classes to choose from, as well as facials, massages and holistic healing treatments. Plus, the on-site cafe dishes out some of the tastiest smoothies, juices and healthy cafe food in town. Six Senses Spa offers an incredible wellness experience too, with treatments being conducted in plush salas or spa villas. You’ll find therapies spanning a wide spectrum - from massages and facials, to reiki treatments and sleep enhancing therapies. Island Organics is a great option if you’re keen on joining in a Thai cooking class (kids are welcome too). If you’re looking to give Muay Thai classes a try, head over to Yodyut Muaythai Gym; the venue boasts modern amenities and excellent trainers. Choeng Mon offers a dining scene that is varied and exciting. You’ll find anything from European gourmet restaurants, to boutique cafes and waterfront venues. At The Larder, the ambience is cosy and intimate thanks to its wood-dominated decor. It’s a great spot for European gourmet fare, and some of its most popular items include the Belly Legal (a slow cooked pork belly dish) and Curried Away (curried lentils with a Scotch duck egg). You’ll find the tastiest plates of Thai food on the island at Supattra Thai Dining. Here’s a pro-tip: seats here are highly sought-after, so reservations are recommended. At Salefino, you’ll tuck into scrumptious Italian fare while soaking up the restaurant’s breezy beachfront vibes. For an upscale, fine dining experience, head to Dining on the Rocks. It’s the signature restaurant at luxury resort Six Senses Samui, with a focus on serving up fusion fare prepared using sustainable, organic produce. Other places that come with our recommendations include SALA Samui Restaurant, Clyde Cafe and Bakery and Aroma Boutique Cafe.